The beauty of art is in the eye of the beholder. SEO is the art of thinking like search engine bots thinking like humans. And it’s also in the eye of the beholder. Unfortunately, Google is the only eye that’s beholding SEO. The rest of us just look like amateur pedants with our analyses, case studies, tutorials, and predictions. Truth is, when it comes down to SEO, all we are left with is to keep up and react. Search engine traffic is one of the most coveted, yet the hardest to build traffic sources. Naturally, the less obtainable it is, the more we want it. Bashing Google is definitely in vogue. Especially when we get caught doing something we should’ve been doing. Or littering the web with poorly spun content. Or inundating other blogs with spam trackbacks hoping to get links back. And when Google shuts us down, we readily take arms against it. But let me tell you something: Google is not to blame. Google’s main objective is to cater to their consumers, shareholders, and bottom line. And they are in business to make money. Can we blame them for it? “Sergey and I founded Google because we believed we could provide a great service to the world—instantly delivering relevant information on any topic. Our goal: to craft the most relevant, up-to-date, comprehensive content we can. Google’s goal: to serve their searchers with the most relevant, up-to-date, comprehensive content they can. Now let’s see how we can help the two to live happily ever after in perfect harmony. Start with relevance and authority optimization. Google’s bots are getting more and more sophisticated at discerning intentions of their searchers and serving them the most relevant results. As a rule, Google tries to find pages that are both reputable and relevant. If two pages appear to have roughly the same amount of information matching a given query, we’ll usually try to pick the page that more trusted websites have chosen to link to. Still, we’ll often elevate a page with fewer links or lower PageRank if other signals suggest that the page is more relevant. For example, a web page dedicated entirely to the civil war is often more useful than an article that mentions the civil war in passing, even if the article is part of a reputable site such as Time.com. Excerpt from How Google Works: Why Does Crappy Website Rank Higher Than Mine? Relevance optimization is not a new concept by any means. “On-page optimization is all about making it clear to search engines that your page is relevant for the topic you are targeting. If you place indexable text on the page, it will be relevant to a large number of topics you don’t target. But its relevance for the majority of those topics will be relatively weak. 1. Focus your site theme to target a specific niche. DON’T target “travel”, “finances”, or “internet marketing” as your niche. “How to Write the Best Content on Earth”. DON’T dilute your theme by adding another unrelated topic just because you are passionate about it, like combining “cooking” and “dating”. Believe me, I’ve seen sites do that. The key is not to stray too far off topic from the core theme of your site. 2. Link to and from relevant sources. If you want to be regarded as a relevant authority source, you need to associate your site with other relevant sites on the subject. Even though you can’t control who links to you and how relevant they are to your niche, when you DO have control (like guest posting let’s say), make sure to pick the right sites. This is where you DO have full control, so make sure you link out to relevant authority sites. Support your relevancy by inter-linking your own posts accordingly. What is that one website you always think of when you need an answer to a specific need? Do you go to Google when you need to find something? Do you go to Amazon when you need to buy something? Do you go to Twitter when you just absolutely have to let the entire world know what you had for lunch?  Do you come to Traffic Generation Café when you have a web traffic related question? That’s my goal. The more authority your site gains, the easier it would be for you to acquire and keep search engine rankings for competitive keywords. In short, the ultimate goal of SEO should be to build authority. If building relevance is your new on-page optimization, then building authority is your new off-page optimization. To say that writing epic content is the first crucial step to building online authority is a huge understatement. Epic content is what gets clicks. Epic content is what gets shared and quoted. Epic content is what gets links. Once you get the “epic content” part down, the rest is easy: promote, promote, promote. Or pick up a copy of Kristi Hines’ excellent Blog Post Promotion: The Ultimate Guide. Search engine optimization (SEO) is the process of improving the visibility of a website or a web page in a search engine’s “natural,” or un-paid (“organic” or “algorithmic”), search results. In general, the earlier (or higher ranked on the search results page), and more frequently a site appears in the search results list, the more visitors it will receive from the search engine’s users. Build your relevance and authority, give Google what Google wants, and actually showing up in the search results might be the icing on the cake. The rules of search engine OPTIMIZATION have not changed since then: You do what the search engines want and they let you play in their indexes. THAT is real-world SEO and it always has been. It’s never going to work any differently from that. Or simply get my free SEO report by clicking on this link. In every niche, there’s always that one site that inevitably pops up in hundreds of niche-related searches. Of course, it always makes you wonder how on earth they were able to pull it off. Chances are they simply started writing epic content long before others realized this wondrous and imaginative way to achieve relevance, authority, and high rankings existed. Write epic content, build relevance and authority in your niche, and give it time. If you like this post and think this would be valuable to your followers, tweet the ish out of it for me, okay? All you have to do is click the button below. Thanks! Do I still Use Market Samurai? Hi Ana, If you’ve answered this question before I apologize! So you need to write great content and I’m assuming that you still need to get backlinks. But you can no longer buy the backlinks. So what’s the best, most effective and easiest links to get? Can you use a service of some sort to make it easier? Or does one have to surf the web and set up links manually now? Thank you! Excellent question, Richard, and the one I don’t have the answer for at the moment, unfortunately. At the moment, I stopped doing much active link building, other that some commenting and encouraging my readers to link to my stellar content more. Other than that, I am still waiting to see what works and what doesn’t in this new post-Penguin environment. Hi Ana, That seems to be the general consensus around the web. I figured you are smarter than most and may have figured it all out quicker. I have to agree with your assessment of your content. Stellar it is! Yours is the only blog that I have a permanent link to. That’s true! So write more stellar content and see what happens. It’s good to see you back to work and I see your up to top 14,000 again. Nice!! Hi Ana, I decide to share my experience. I had a post that was ranked around #25 for keyword. The keyword was getting around 15,000 searches per month. It looked good to try to get my post to move up so I hired a guy on fiverr to do so social bookmarking for me. I got 143 social bookmarks. My post moved from #25 to #1 in less than 24 hours. It stayed #1 for 2 days then dropped to #2 for 1 day then … well … I can’t find it in the top 100 anymore. So should I say that the moral of this story is that social bookmarking no longer helps? I’ve read that some back links can actually hurt you now. And that seems to be what happened here. I turned a #25 ranking into an MIA post. Needless to say I haven’t been on fiverr since then. My blog has moved from 1.5 million to 518,000 in the last 60 days by just writing content. I won’t say it’s stellar but Google seems to like it. Maybe I should leave well enough alone and just see what happens. My blog keeps moving up in Alexa most days. Maybe I should just be happy enough with that. Than you for your feedback! Very honored you have my blog on a speed dial, Richard! I’ve been playing with some authority/link building strategies, but nothing concrete yet. For instance, I tried to see if the power of social media (i.e. lots of RTs) would help to move a post up. It didn’t hurt, but didn’t help either. I’ve been reading a lot of blogs on the subject and no one else seems to have a slightest idea what actually works these days. Of course, content alone won’t get us anywhere (or far, I should say), Prabhat; we always need to promote our content, and that’s where SEO comes in. I just love this post, Ana, it just helps to explains several points about that very dark world called SEO. Thanks. Sent two tweets(@oegbule) and shared on FB too. I’ll never really understand SEO, but I don’t really care to either. If I get some traffic from Google, cool but I haven’t gotten 1 single conversion from it on this blog. 15 minutes of posting on WarriorForum gets me way more traffic and subscribers than spending all day “thinking like search engine bots thinking like humans”. I’d rather spend $1k per month on solo ads and banner ads and use some sweet social media content spreading techniques than “convincing the search engines you are relevant for keywords you probably aren’t.”. Love the Twitter quotes on this! Good point, Gabe, and for those with a budget, it’s definitely a viable solution. Warrior forum… I need to start being more active there. I recently made 2 “appearances” there and got almost 300 visitors from that. Not bad! Ana, not only is your writing outstanding on this topic but the images and quotes related to it are really spectacular. I think SEO takes time and many are not willing to wait that long and stick with it. It’s not the age of the domain but how much one updates it with relevant content. That’s what can make a difference in the future. I really like how you kept this post super simple to understand and digest. Thanks for the links to the other blog posts that talk about promoting blog content. I am always looking for ways to drive more traffic into my blogs so these posts will come in handy! What is one of your favorite tactics Ana? I find that I spend the majority of my time networking with other bloggers, either on social media or on their blogs. Not that it’s my favorite traffic generation strategy, but it is the one that matters the most. I would have to agree with you Ana. I am working on implementing this strategy more and more every day. Nothing is better than having a personal connection with someone you can create a win/win with! Definitely, Scott. And I look forward to seeing you around! It’s easy to find a scapegoat, and in case of SEO, Google is a very obvious target. Another excellent post Ana! I remember you asked me what my niche was when you first asked me about what my blog was about. I had natural healing and internet marketing tools on the same blog. Last year I went in and narrowed my focus. My traffic is now coming from those individual niches now and I am so thankful for Thesis. I notice everytime you post an article, you are always linking to other pages on your site so I started doing this as well. Internal linking is necessary and I am sharing this technique with my readers. Is having a sticky list builder widget on the left side of your site converting better than a widget on the right or having opt in boxes on the header or footer? Guess that is another thing to track in Google Analytics. See you online soon! Yes, I remember that, Danielle, and so glad you were one of those rare people who ask for advice and then follow through with it. I don’t have any solid stats on the optin in the sidebar yet (I’ve had it for a few days only), but it’s definitely converting. I have been trying to to write a better content for my website. As it is now really important to create an authority in your niche. Can you please guide me & suggest any article or way by which I can develop my writing skills. Another thing is that how can I find more interesting & new topics which have good amount of traffic . I am actually writing a post for tomorrow (hopefully) where I’ll take apart one of my old posts (I used to write much duller content back then) and compare it to the new one on the same topic. Hopefully, that will give you enough info to jump start your way to better writing. There’s no doubt that SEO is a frustrating process. It sometimes can seem like Google just likes to mess with us all. However, it must be done. The key to succeeding in SEO is to be open to change. If you are using outdated tactics and aren’t adapting you won’t see much improvement. I can only imagine what Google is doing to your business, Nick. Hey Ana, you’ve written it again, i especially like your Tip 2 & 3….. Link to and from relevant content and the issue of Internal Linking. I can’t agree more more I’ve noticed some tremendous results before doing this alone, but i only wish we can always practice what we learnt. BTW: I like your new gravater image. Now that Google is waving a big red STOP sign at exact match anchor text, the best way to associate ourselves with a certain topic is to show relevance, especially to the sources that are already ranking for our target keyword, Theodore. you make a very good point about time, which I think is a much bigger factor than many think/give credit. I am referring to first mover advantage, as well as domain age. Exactly, Sunil – simple domain age does make a difference. I think this is the first post I have read on a blog that really gets what this SEO thing is all about. Many bloggers are so frustrated that some will even promote that we can do without Google. But can we really? How far can we go on our own and how much time are we going to spend marketing our site to get as much traffic as Google can send us? Whether we like it or not we need Google and though their ways may not seem clear at times I am sure they really mean well. And it’s for our own good really. I am all for diversification and I’m currently working on many methods to bring in more traffic from sources other than Google. However, I still love Google traffic and plan on getting more of it as well. I have always relied on search traffic alone but recently Google have shown they cannot be trusted since in the process of making their search more friendly they’re affecting quality and authority sites too because robots are trying to be humans. Now I am forcing myself to use social media which I am not really great at. But it’s all good. It has never been a good idea to put all our eggs in one basket anyway and this also include monetizing our sites. I really pity those who rely only on Adsense to earn these days. With more effort on guest posting, great comments, social media and networking I’m sure we’ll all do well. To be quite honest with you, I strongly dislike social media, Karo, but if that’s where our readers are, that’s where we shall be. Giving it time is what I struggle with quite a bit myself, Ryan, and it’s definitely something we need to keep in mind. Ana – nice summary. On another note, manipulating Google and backward engineering their algorithm are both becoming more difficult. Let’s take social media as an example. Getting tweets, shares, and likes seems to provide an initial pop in the rankings, but if it does not seem to lead to much in the way in long term rankings benefits if the social activity does not generate links. Anything needs to have a logical backup, Randy. If a site is getting many tweets, but no traffic and/or logical backlinks as a result of being mentioned so much, then you, I, and Google know that something is fishy. I was just playing with Twitter to measure SEO effects, by the way; will post the findings if there’s something interesting. ….or you could just keep chugging along, building your list, networking with others within your market who genuinely like you and will promote you (and doing the same for them),leveraging all that traffic within your tribe and theirs. I’m going to be real honest with you. Apart from eCommerce type websites in which a purchase is imminent and it all boils down to which website the visitor is going to buy from, search traffic, for as good as it is for targeted “money” words, is not near as effective for a general market website. I would be willing to bet that the majority of the people who actively follow you, have done so either because you were mentioned by someone they trust, you made a comment that made perfect sense to them or you wrote something on another website to a satellite community in which your worldview fit “theirs”. I think it was Aaron Wall who once mentioned that “SEO” was referral based implying that ranking for such a word wouldn’t give as good of a return as the time it would take to invest in the community instead. When he said that, it made complete sense to me. Frankly, there are some markets that simply do better from within the community than from focusing on targeted keywords for traffic. I actually completely understand and agree with your opinion, Leo. The only search engine traffic I really would love to keep and grow is the one going to my review posts – most of the searchers for those terms are great potential buyers. Any other search engine traffic I get is the icing on the cake. You are right: the best kind of traffic we can get is through referrals. HOWEVER, search engines CAN potentially introduce us to our future readership; that’s how many of my new readers and getting to my blog. So while I DO put my focus on building my brand and authority through networking and promotion, I won’t say no to potential SE traffic either. I totally understand, Ana. It just pains me when great blogs such as yours start to depend on search traffic and then feel slighted when Google changes the rules. For blogs like this, it becomes very, very personal because I know you pour your heart into it. As usual you are bang on, we often ignore the very basics and then run after everything we get. SEO is less about optimizing your site for search engines and more about optimizing it for real users. SEO should be done but keeping the visitor in mind. If we can do that, Search engines will acknowledge that. We may call that “Authority”. No question about it, Akhilendra. I love the way yu wrote this – and I absolutely agree with your point about authority (but you knew that). Well, what are you doing reading my blog – go have fun!!! I know, I know. Actually this is the only article I read – I checked it out indirectly because I got a mail from you about sticky email lists and you said that you use that product on every post, so I thought I’d quickly check on your latest post and got drawn in y your familiar writing.